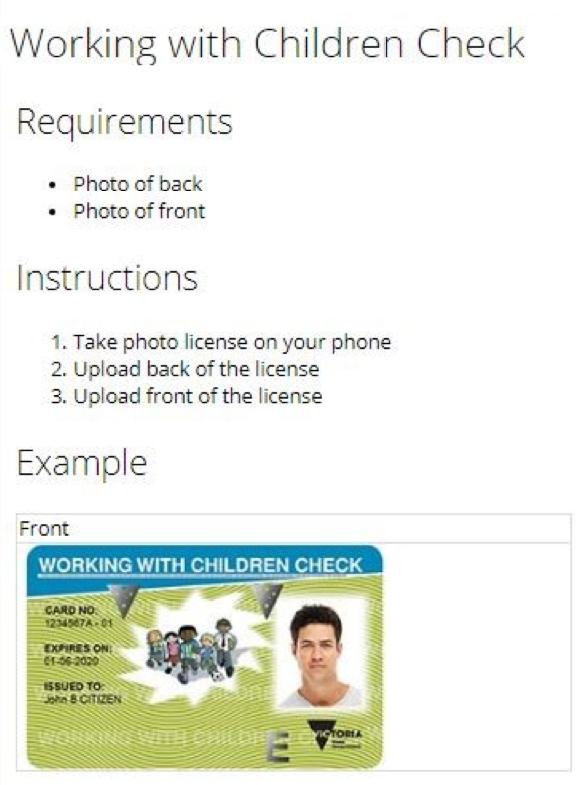 The Skills Matrix is designed to collect documentation from your employees, from Working With Children Check to Drivers License to any documentation required for employment. Approve, or Decline skills. You can also comment on them and review the files. This includes downloading and viewing all the submitted documentation. you can have an archive of all their submissions attached to their Employee username. To turn the skills matrix on navigate to Menu > Settings > General > Global. Then under Feature Settings select the Skills Matrix button and Click update. Now you're ready to configure your first skill! After writing a name appropriate to the document (e.g. Forklift License). To add a new Skill click the blue 'Add skill' button. On the left, you will see all the configuration settings for the skill. The blue i will give you a description of each point. (1) Title: The Name of the Skill. (2) URL: A link to a third-party resource that can be used to complete the skill. (3) Group: The group of your staff that are required to complete this skill. (4) Severity: How important is the collection of this skill. Critical: Employees cannot clock on until they complete this skill. Important: Required for Employment, encouragement of skill completion will be prominent in Microkeeper. (5) Docs Required: Do you require documentation to be uploaded for the skill completion? (6) Attachment: Is there an attachment for the employee to use to complete the skill? e.g. a Form to be completed? (7) Expiry: Does this Skill have an expiry date? e.g Forklift licenses require evaluation after 3 years. (8) Expiry Limit: What is the maximum length of time before the skill needs to be completed again? (9) Expiry Reminder: How long before the skill expires do you want to remind your employee that it expires and needs to be resubmitted? This is where you can outline the instructions you wish to provide your staff with, on how to complete the chosen skill. Along the top of this page are all of the word processing options, e.g. headings, bold, italic, alignment etc. Mousing over the icons on the menu bar at the top of the editing window will cause more information about that option to appear. To insert an image click the icon of the mountains on the menu bar. This will open the image insertion box. Alternatively, you can click the chain icon to link a picture from an URL. 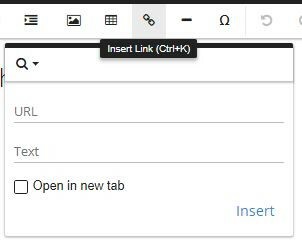 To insert a link you can click the small chain icon and enter the URL of the link you wish to add, as well as what text you want the link to say. You can also set the link to open in a new tab in their browser when the employee clicks on it. 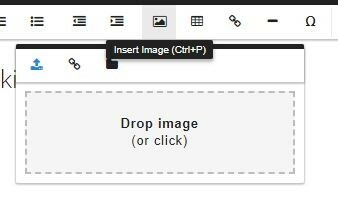 When you have completed drafting the instructions, save your work by clicking the floppy disk icon on the far right of the menu bar. Once a skill is made active, employees will be able to complete your instructions and submit required documents for approval from their Employee Console. 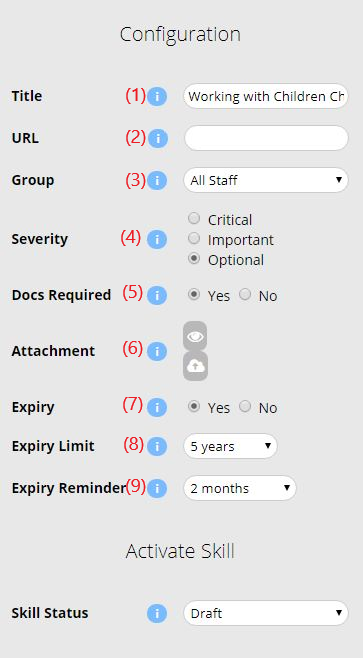 The instructions you create will be displayed above the box displayed below where the expiry date can be entered, documents uploaded, and any comments made. When uploading documents you also pick the size of the document. On this page, a submitted skill can be commented on, edited, declined or approved. To view, the attached files click the eye icon (see red arrow) and it will open the file in a new tab for you. A skill can be submitted on the behalf of an employee as well, simply click the On behalf button on the left of the screen (see red arrow). The File Manager page allows you to view and search all the files that are within your account on Microkeeper. You can also delete them and upgrade your storage plan if required. To delete a file click Delete Files button on the left of the screen, then click the trash can icon that appears next to the file you want to remove.